If we’d been interested in stopping at a nice biblical number to justify a catchy title, something like The Seven Mountains of the Supernatural War, we’d have ended the book at Mount Zion. But this book would be incomplete without bringing up an eighth holy mountain, one that’s had a tremendous and incredibly destructive impact on the world. This mountain is responsible for what statisticians say will be the world’s largest religion by about 2070 unless something drastic happens. In that regard, we must give credit where it’s due—this mountain was, without question, the site of the most successful supernatural PSYOP in history. The Arabic name of this peak means Mountain of Enlightenment. Jabal al-Nour is near Mecca in western Saudi Arabia. It’s the site of the cave where Muhammad was visited by an angel calling itself Jibril, or Gabriel. The message was not from God. Yahweh does not contradict Himself, but the Quran clearly does. Muhammad saw something, of that we have no doubt. But it was not a messenger from Yahweh. We’ll deal with the specific beliefs of Islam and its major sects in the book. Islam has a role to play in the future conflict for God’s holy mountain, but sadly for Muslims, the part the Fallen wants them to play is very simple—to die. Allah is the name used for the god of Islam, but it’s also the name used for the God of the Bible by Arab Christians. This is somewhat confusing, which is, of course, not coincidental. Just as El was the name of the chief god of the Canaanites and a generic name for God in Hebrew, “Allah” is another PSYOP by the Fallen to muddy the water. By analyzing texts that have been found from the Neo-Assyrian, Neo-Babylonian, and later Egyptian kingdoms, we can piece together a history that seems solid. While the name “Amorite” fell out of use after the conquest of Canaan, there are a couple of tribal names that bridge the period between the disappearance of the Amorites and the emergence of the Arameans. Specifically, the Aḫlamū, sometimes called Aḫlamū-Aramayū (Aḫlamū-Arameans) by the Assyrians, and our old friends the Suteans. In Iraq, where ISIS is hard pressed at this writing by Iraqi, Kurdish, Turkish, and American forces in the city of Mosul, analysts at the Combating Terrorism Center at the U.S. Military Training Academy at West Point suggest that ISIS has already prepared a fallback plan in Diyala province if they can’t hang on in Mosul. The analysts feel the terrain and the demographic makeup of Diyala is especially well suited for an ongoing insurgency.⁠2 That’s the area northeast of Baghdad along the Diyala River toward the Hamrin mountain range, where more than four thousand years ago the doomed Sumerian kings of Ur built their futile Amorite-wall-which-keeps-the-Tidnum-at-bay. All of this begs the question: What foul spirit is at work in MAR.TUki, the ancient land of the Amorites? Let’s dig a little deeper. And, if you’ll indulge us, we’ll get a little speculative. As we’ve noted, there is only so much we can know for sure about the spirits opposed to God. They lie, and our perception into that realm is limited. But let’s look at what’s available to us and see if we can draw some tentative conclusions. Most Bible scholars who trace the movement of the nations that dispersed from Babel in Genesis 10 place two nations that mentioned in Ezekiel’s prophecy of the Gog-Magog war, Sheba and Dedan, in Arabia. Sheba was the father of the Sabeans, who founded a kingdom in southwest Arabia, modern-day Yemen. Dedan settled along the coast of the Red Sea in western Arabia, in the area called the Hejaz. Dedan was an important oasis along the caravan route between Sheba and Babylon. Because of the brutal desert that covers the interior of Arabia, the route traveled north through Edom, just southeast of Judah. Dedan eventually grew into an independent kingdom around the time of the prophets Ezekiel, Jeremiah, and Daniel, in the 7th and 6th centuries B.C. The last king of Babylon, Nabonidus, spent most of his reign living at the important Dedanite oasis of Tayma while entrusting Babylon to his son, Belshazzar—he of the mene, mene, tekel, upharsin incident. Nobody is sure why Nabonidus spent a decade living in the desert, but the best guess is that he was seeking prophecy and guidance from his preferred deity, the moon-god Sîn, who the king elevated to the top spot in the pantheon. Note that Marduk is missing from that list of deities. Nabonidus probably made an enemy of the established Marduk priesthood in Babylon, possibly creating a religious fifth column that contributed to the ease with which Babylon fell to the Persians. It’s believed that Nabonidus’ mother Addagoppe (Adad-guppi—notice the theophoric element Adad) was a priestess of Sîn from Harran in northern Mesopotamia. Remember, Harran was the moon-god’s cult center that was so important to the Amorite Binū Yamina tribes in Abraham’s day, 1,400 years earlier. So Nabonidus may have been of old Aramean/Amorite stock, and for some reason—call it infernal revelation, if you will—he was compelled to revive the flagging cult of Sîn and transplant it to the Arabian desert. Nabonidus, the last king of Babylon, shown worshipping the moon-god Sîn, the sun-god Šamaš, and Ishtar, represented by Venus. Credit: Jona lendering (own work), CC BY 3.0, https://commons.wikimedia.org/w/index.php?curid=2629946. The moon-god has a long history in that part of the world. Not only do we have the evidence of the cult centers of Ur, Harran, and Jericho that date back to the 3rd millennium B.C., but remember the account of Gideon’s victory over the Midianites, another people who lived in northwestern Arabia. Gideon’s huge haul of gold included the crescent ornaments from the Midianites’ camels, which presumably honored the moon-god. Symbols depicting a heavenly triad of Sîn, Šamaš, and Ishtar—moon, sun, and Venus—are common from the mid 2nd millennium B.C. 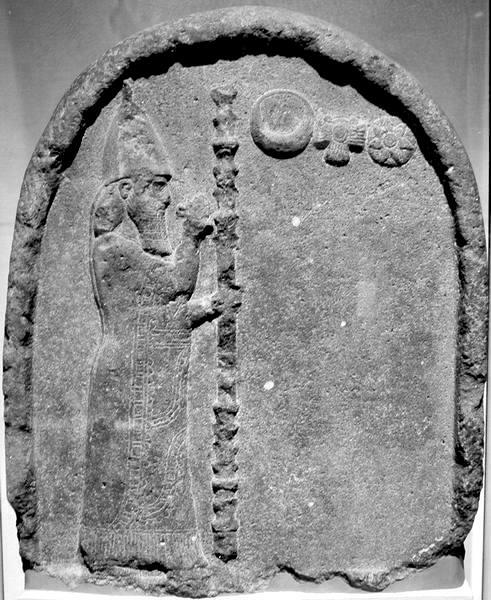 at least through the time of Nabonidus, who is depicted venerating the three deities on stela that have survived. While the star and crescent symbol prominent in the Islamic world today only came into use after the Ottomans took Constantinople in 1453, it’s not too much of a reach to suggest that the ancient cult of the moon-god in the Near East and Arabia has been carried into the modern era by the descendants of the Amorites, Arameans, and their Arab neighbors to the south, especially with the boost given to the moon-god’s cult in Arabia by the king of Babylon during the last days of that empire. Why is this of interest? While Sheba (Yemen) seems almost geographically irrelevant to end times prophecy (except maybe as a flashpoint for a wider Sunni-Shia war), Dedan, as we showed earlier, bears the same name as the ancient Amorite tribe Didanu/Tidanu, from which the Greeks derived the name of the Titans. And the area settled by the Dedanites, the Hejaz, includes the two holiest sites of Islam, Mecca and Medina. While Muslim scholars would argue the connection, the symbolic link, at least, is obvious. Joel Richardson does an excellent job of establishing the pagan roots of Allah in his new book, Mystery Babylon. The historical link between Nabonidus, the moon-worshiping king of Babylon, and the region of Islam’s holiest sites may be coincidental, but you know our feeling about coincidence theories. Nevertheless, it’s fascinating that history has once again provided a spiritual link between the past and the future where we never expected to find one. 1 Bodi, op. cit., p.409. 2 Mello, Alex and Knights, Michael. “Losing Mosul, Regenerating Diyala: How the Islamic State Could Exploit Iraq’s Sectarian Tinderbox,” Combating Terrorism Center, October 25, 2016 (https://www.ctc.usma.edu/posts/losing-mosul-regenerating-in-diyala-how-the-islamic-state-could-exploit-iraqs-sectarian-tinderbox), retrieved 12/22/16. 3 Gadd, C.J. “The Harran Inscriptions of Nabonidus,” Extrait d’Anatolian Studies, VIII (1958), pp. 35- 92. In: Syria. Tome 37 fascicule 1-2, 1960. pp. 194-196.